The Sweet Bookshelf: Debut Giveaway! Welcome to The Sweet Bookshelf! of R.J. Anderson's debut novel! That's 2 winners! That's easy! Just leave a comment! If you'd like an extra entry, become a follower and tell me in a separate comment! Don't forget to leave me your email address! Good luck! All Weekend Contests end Tuesday July 14th midnight PST. All Weekend Winners will be announced Wednesday July 15th. Don't forget to come back tomorrow for another surprise giveaway! Tell your friends! Forget everything you think you know about faeries. . . . Creatures full of magic and whimsy? Not in the Oakenwyld. Not anymore. Deep inside the great Oak lies a dying faery realm, bursting with secrets instead of magic. Long ago the faeries mysteriously lost their magic. Robbed of their powers, they have become selfish and dull-witted. Now their numbers are dwindling and their very survival is at stake. 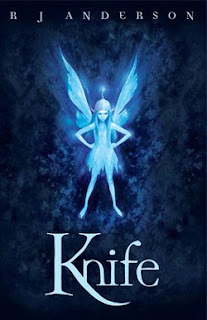 Only one young faery—Knife—is determined to find out where her people's magic has gone and try to get it back. Unlike her sisters, Knife is fierce and independent. She's not afraid of anything—not the vicious crows, the strict Faery Queen, or the fascinating humans living nearby. But when Knife disobeys the Faery Queen and befriends a human named Paul, her quest becomes more dangerous than she realizes. Can Knife trust Paul to help, or has she brought the faeries even closer to the brink of destruction? 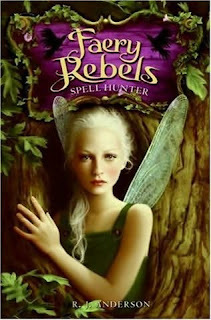 Talented newcomer R. J. Anderson creates an extraordinary new fantasy world and weaves a gripping tale of lost magic, high adventure, and surprising friendship in which the fate of an entire realm rests on the shoulders of one brave faery rebel. Looks like this is a great read. Mary, you should feel special this is the first blog I think I've ever commented on besides Colleen's. P.S. not to be nit picky, but I think you have your dates wrong the 11th is saturday. HAHHA! Thanks Luke! lET ME CHECK THE DATES AGAIN! I'm an old follower, does that count? I'm lovin this site Mary! Such a good idea! Enter me girl. I'm also a new follower now. Luke is pretty excited to be a follower! Where did you get the layout? Me likey much. Oh yay! Count me in! You are so cool Mary. Good idea to start this blog. I am not reading anything right now so I feel kinda naked!!!! Great blog, Mary! Can't wait to read Wings and put in a "Professional" comment! This bok looks soo good! I became a follower through Google Reader! Please include me. I have read so many great things about this book I cant wait to get the chance to read it. This book sounds terrific, and you have an adorable blog! Thanks for the great giveaway! How exciting--I love to read, but sadly, I don't have as much time as I used to! How cool are those covers. Please count me in. Did I miss the giveaway? I would love to read this debut novel, please enter me, and I am now following your site!